Before we dive into our re-vamped Santa's sleigh, we'd like to take a moment to say thanks. We truly appreciate you reading our newsletter each month and supporting our products in 2011. We've had our best year ever and we couldn't have done it without you. From all of us at Hamilton Caster, thank you! We hope you had a Merry Christmas and we wish you a Happy New Year. And now, it's time for Santa's sleigh, Hamilton Caster style. We heard from Santa after his world tour and he asked us to help him out with a new design for 2012. We think all the children, reindeer, elves and Santa himself will be quite pleased with our design. 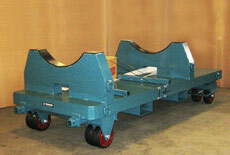 • Heavy Duty Ground Support Casters. 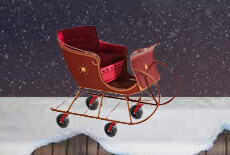 When Santa's enormous sleigh hits the ground, it needs to glide smoothly without shattering the precious cargo. These casters will ensure Santa and his elves a soft ride that can handle the heaviest and most precious loads. We could even throw in dual-wheel versions depending on how many presents he's delivering. And for added bonus, gray non-marking tires make it look like Santa was never there. • Heavy Duty Solid Pneumatic Wheels. No matter how harsh the elements outside, Santa will be covered with these rugged wheels. The shock-absorbent wheels handle up to 4,200 lbs. and roll on uneven surfaces. They also have low-rolling resistance, so the reindeer won't wear out before Christmas morning. • Fifth-Wheel-Steer Trailers. If Santa runs out of room in his sleigh, we've got him covered with trailers that can handle up to 10,000 more lbs. These trailers are designed for power towing and offer low-rolling resistance; perfect for Santa and his crew. We could even do a custom paint job with red steelwork. Last month we introduced our latest build-ready caster series that's designed to haul the biggest loads on the planet. Now they're flying out of our factory – literally. Eight of these massive casters have been shipped to San Francisco, California, to transport bridge components. Each caster handles up to 40,000 lbs. Massive bridges like San Francisco's Bay Bridge can weigh upwards of 800,000 tons when complete, so each piece must be carted into place for construction. A perfect job for casters that haul 20 tons each. Learn more about our behemoth caster. 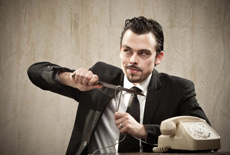 By now you've heard the rumblings about cold calling's demise. But it's not time to whip out the casket and cut the phone cord just yet. There's still use in calling prospects, but the priority has shifted to social media. And it's time for sI WANT THAT DEMO!aI WANT THAT DEMO!lespeople to adapt. The prospects who would have happily picked up the phone 20 years ago are still out there, but they're not answering the phone before they check Facebook and Twitter. Sales experts now recommend building relationships on social media first, then following up on the phone. Social media takes the cold out of cold calling, and it offers salespeople an easy way into a prospect's circle. So what can you do to start? Take a look at the prospects you're interested in, and see if they use social media. If they are, have a conversation on whatever medium they prefer. Share content like white papers, info graphics or blog posts. Gently nudge them to show your interest. If they bite, transition to the phone where you can talk real-time and make your pitch. Selling in the 21st century isn't as fast as it may have been years ago. But with the addition of social media to gain the respect of your prospects, you now have better opportunities to build relationships that boost your sales. Have you already shifted to social media, or do you still prefer the old rotary dial? We're packing up our full line of industrial casters and hitting the road in February for MODEX 2012, a new expo for manufacturing, distribution and supply-chain industries. Find Steve Lippert, Mark Lippert, or Marty Wilson, at booth 1421 and learn about how our products tackle problems in these global industries. 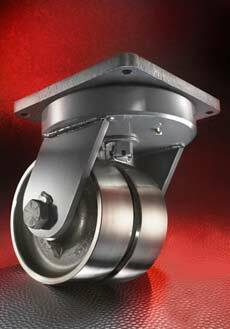 We're featuring our entire caster lineup, including the new Ultra-Maxi Duty Caster that handles 40,000 lbs. And for oil junkies: Check out our new drum-handling equipment. We look forward to networking and discussing trends and innovations in the industries that keep us moving. Stop by our booth and let's talk. MODEX will be held at the Georgia World Congress Center in downtown Atlanta from February 6-9. More than 500 companies will be on display for the inaugural event. 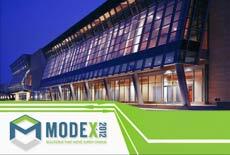 For your free ticket and more information, visit modexshow.com. In 10 years, the beef you chow down on might not come from a cow, no matter how rare you like it. Scientists in the Netherlands are one step closer to engineering a lab-grown hamburger by using stem cells from leftover material at slaughterhouses. The only problem? It costs $340,000. To construct the burger, the biologists must assemble thin layers of muscle strips that are packed together with lab-grown fat. The muscle strips are grown in a feed made of sugars, amino acids, lips and minerals. To make a thick hamburger, they'll need to grow 3,000 of them. Aside from the steep price that stems from the time-intensive process, there are some downsides to a scientifically engineered burger. First, it won't look like meat because there's no blood. Mark Post, a vascular biologist at the University of Maastricht, says it'll look similar to a scallop. It's also not entirely guilt-free, either, because the stem cells are harvested from leftovers at slaughterhouses. And, unfortunately, it doesn't taste as good as a real burger just yet. As for the benefits, producing artificial meats can drastically reduce energy consumption by 60 percent, so in the end they could end up being cheaper to produce and better for the environment. But for now, the team is focused on producing their first burger. Then they'll worry about the taste and texture. 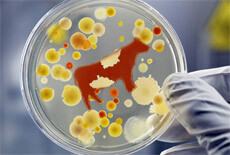 Are you ready to sever ties with the cow and indulge in some lab-grown beef?